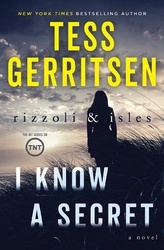 Is it lights, camera, death for Rizzoli & Isles? The crime scene is unlike any that Detective Jane Rizzoli and medical examiner Maura Isles have encountered. The woman lies in apparently peaceful repose on her bed, and Maura finds no apparent cause of death, but the woman is undoubtedly dead. The victim's eyes have been removed and placed in her hand, a gesture that echoes the horror films she produced. Is a crazed movie fan reenacting scenes from those disturbing films? When another victim is found, again with no apparent cause of death and in a grotesquely staged crime scene, Jane and Maura realize the killer has chosen one particular woman for his next victim, and she's the only one who can help Jane and Maura catch the fiend. But she knows a secret. A secret she'll never tell.